It is common for adults and kids to get hurt during any form of sports, especially contact sports. Unfortunately, the face often is the main area of damage — making athletic injuries a major link between sports and dentistry. It is common — especially for kids, but also for active adults — to get hurt during any form of sports, particularly contact sports. Unfortunately, the main area of damage often is the face — making athletic injuries a major link between sports and dentistry. Sports-related dental injuries can range from minor chips to the complete loss of a tooth. If a tooth is chipped, gather up the broken pieces and take them to the dentist for repair. But if the entire tooth has been knocked out, it’s important to act swiftly and carefully to increase the chances of saving the tooth. If it’s a child who has lost the tooth, confirm whether it is an adult tooth. Baby teeth are not re-implanted. Never touch the tooth by the root. The root contains important fibers, called periodontal ligaments that are necessary for proper healing. Handle the tooth by the chewing surface area. If the tooth is visibly soiled, rinse briefly with tap water. Do not scrub the tooth. Immediately put the tooth back in the socket, if possible. If putting the tooth back in the socket is not possible, go immediately to a dentist or the nearest emergency department and be sure to take the tooth with you. While en route to medical care, put the tooth back in the mouth next to the cheek or in a small container of milk — not tap water — so that the root stays moist. “Time is an important factor in the survival of the tooth,” Dr. Coy says. If the tooth is replaced into the socket within five minutes of being knocked out, it is likely the tooth can survive. Between five and 60 minutes, there continues to be a good survival rate as long as the tooth has been stored properly. If the tooth is out of the mouth for more than 60 minutes, the chance for survival decreases significantly. 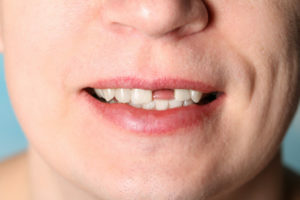 At the dentist’s office or the emergency department, the tooth likely will be re-implanted and splinted to the adjacent teeth for two to eight weeks, Dr. Coy says. During that time, a root canal will be necessary for long-term survival of the tooth. “Despite the best methods for saving a tooth that has been knocked out, it is clear that prevention is the best strategy,” Dr. Coy says. An athlete is 60 times more likely to suffer dental injuries when not wearing a mouthguard, says the American Dental Association. A properly made mouth guard can protect the teeth by cushioning the impact and dispersing the forces. Whatever the type of mouthguard — ready-made, boil-and-bite or custom-formed by a dentist — it can add a tremendous amount of protection and should be used with all contact sports with the potential for mouth injury, Dr. Coy says.